Bryan Widener saw a hole in the Sacramento doughnut market and went about filling it. After a trip to Portland and a sampling of gourmet doughnuts from the famous Voodoo Doughnuts, Widener thought, “I could do this better.” He started whipping up batches of delicious fried dough for friends and realized he had a knack for doughnuteering. The name “Doughbot” was born out of a love for puns and old wind-up robots, which Widener, and Dannah O’Donnell, his wife, share. 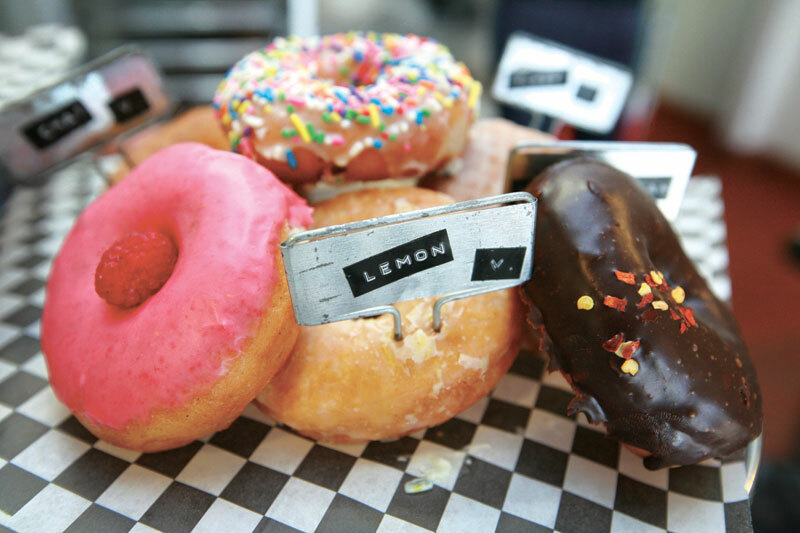 “I noticed there was a serious gap in Sacramento as far as good doughnuts,” he said at his favorite local haunt, Oak Park Old Soul, back in June. Most local doughnuts are made with pre-mixed ingredients. In contrast, Doughbot’s are made from scratch, batter to filling. Widener also fries them in soybean oil, so they’re a tiny bit healthier. When he bought his equipment from a local doughnut vendor calling it quits, the guy threw in the left over frying grease; it was straight beef fat. Widener is pushing pastry boundaries into new frontiers. Bacon, vodka, fresh fruit and berries, and nutella are just a few of the ingredients he uses. He honed his skills as a professional cook for nine years, including a stint at Magpie Café before quitting to pursue a career in doughnuts. Doughbot’s most popular doughnut is the maple bacon doughnut. When Widener tried his first bacon doughnut up in Portland it was just a strip of bacon across a maple bar. At Doughbot he actually takes bits of bacon and includes them in the filling of his maple bacon doughnuts. “You know how you go to Denny’s or Pancake Circus and a little maple syrup gets on the bacon and it’s all good,” Widener said. Another popular pastry is The Dude, a white Russian doughnut named after the main character in the cult classic movie, The Big Lebowski. This doughnut is filled with Kahlua, vodka and Bavarian cream and topped with a Kahlua, vodka and cream glaze. Widener also specializes in vegan delicacies. He said his whole-wheat vegan doughnuts are so good most people can’t tell they’re vegan. On September 3rd, Sacramento’s only gourmet doughnut shop opened in the former home of Ricksha on 10th and W streets. After months of cleaning, degreasing, and transforming the former Japanese restaurant into a pastry paradise, they were met on the first day with lines outside starting at 5 AM; they were sold out before 9. At 9:30 AM O’Donnell looked tired, and the chalkboard sign was only half finished: “Welcome to Doug” it read. Welcome, indeed.